Don’t be fooled! Don’t be taken! Salt-less Gizmos don’t soften water. Many companies promote salt free devices as an alternative to traditional water softeners. While the concept seems interesting, laboratory tests by independent third parties & universities have proven that these products do not deliver the benefits of soft water, and they cannot provide reproducable science by which they can be tested, nor do they have a certified standard like other water treatment products. Softer skin: Not a chance! No water spots on glasses and shower doors: Buy new glasses! No reduction in soap or detergents: Buy stock in Tide! 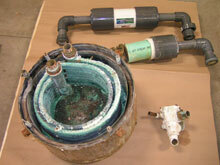 No prevention of hardness & soap curd accumulation in drains and pipes: Hello Rotor Rooter! There are several types of alternative methods being touted in the marketplace. Most of these products are being sold by Pyramid or Multi Level marketing groups, not licensed or certified installers of plumbing devices. Think about it! If these devices really worked, don’t you think that the professionals in the water treatment industry would be selling them, especially when you can make 2-3 times the profit of a water softener. Not only that, with economic times being slow the water treatment professional could be offering these to cosumers to generate sales. 1. Magnetics. These devices are just what they sound like. A magnet. The theory behind this crazy idea is that the manufacturers think that since hard water carries a positive charged Ion, that if they strap, bolt, or plumb a magnetic device on the outside of the pipe that attracts the negetaive Ions they will remove hardness or reduce scaling. Great thought, but where did it go? Would it not cling to the pipe? Illustrations below show an actual magnetic device that had to be removed after only 1 year when a laundromat’s 3rd boiler failed. Magnet based devices also claim to reduce scale and calcium build up in pipes and water based appliances. Third party research has consistently concluded that these products DO NOT work in all water conditions, nor in a consistent, predictable way. See the facts below by third parties! WQA 34 separate report papers indicate that Magnetic physical water treatment does not work. The Army Corp of Engineers tested two magnetic devices (Descal-A-Matic and Aqua Magnetic) and one electronic device (Ener Tec) in 2001. The findings do not support the claims of the manufacturers regarding the ability of their respective devices to prevent mineral scale formation in hot potable water systems. Click below to see what our government has to say about these devices. They no longer buy them. Penn State University states there is virtually no valid scientific data to support any water treatment benefit from magnetic devices. Companies use testimonials from “hundreds of satisfied customers” to support their claims. Click below to see what these professors had to say. 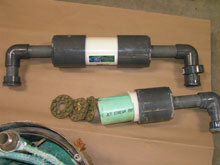 Purdue University tested 6 unidentified magnetic water conditioning devices and compared them to untreated water. Testing lasted for 240 days. No beneficial effect was seen for the magnetic treatment devices. Click below to see what this university discovered. Actual Field Sample from a Laundry Mat operation to prevent Scale buildup in the boilers. 3 Boilers later they removed the magnetic device after 1 year. Manufactured said to them ” It was not installed correctly” Yet the manufacture installed the device in trade for positive testimony. 2. Bead Crystallation Technology. If any future Alternative Physical Water treatment process has the possibility of getting approval and being able to be a “true” Salt-Free Conditioner, this might be the technology. But Not Yet. These types of companies are out there touting approvals of these products by a certification in Germany called the DVGW approval. The problem is that no standard in the USA exsists for this technology for which these devices can be tested. Same story… hard water in, hard water out! The standard of testing in Germany is at a much lower electrical standard and heating standard than here in the United States. 3. Wires wrapped around pipes. This one you can even try at home! 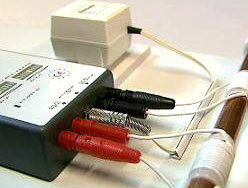 Get two pieces of wire, wrap it on your water line, and touch the other end to a battery or outlet, and Wham! you have soft water. Sounds great right? It is a scam. By buying these devices you will not have soft water or scale free water.You will not have cleaner clothes, reduced soaps and detergents, but you will have a place to hang your blouse to dry. Abendroth Water Soft Water Exchange Service: Regeneration takes place at Abendroth Water Condiitoning. There is no salt or discharge on the customer’s premises. Abendroth Water Silex Purification Water System: A salt free system delivering softened DI quality water to every tap in your home. When exhausted just change mineral bag and return to us for regeneration. Also available for Carbon and other medias. 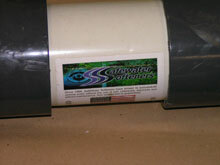 Abendroth Water Conditioning Automatic Filters: We have a full line of Filtration that uses no salt to regenerate. Chlor-Guard Carbon Filter, Iron Guard, Sulpher Guard, Iron Curtain, and many others custom suited for your home. Whole House Reverse Osmosis: A salt free system that improve the drinking water in your home, or can service all of the water in your home when other technologies do not. No Sodium Softener Alternative: All Abendroth Water Softener systems can use Potassium Chloride as an alternative to Sodium Chloride.